GAMBIA 1938 Sg150 -Sg161 SET of 16. Gambia Mixed lot. Includes GV Crown CA x 3 values & Script CA x 2 values (some lightly mounted). Also various other later stamps in mixed condition. MM & MNH. Total cat just over £150. EDW1949SELL : GAMBIA 1963 Scott #175-87 Birds. Complete set. Catalog $71.00. Complete set. 1963 Scott #175-87 Birds. Doing that is against U.S. and international laws. a pretty image. GAMBIA George VI 1938 SG150/61 set of 16 - mounted mint. Catalogue £170. Gambia Sc. 102-120 MLH Elephants. Goods will be dispatched upon clearance of funds. Gambia 1938-46 set SG150/61 MNH cat £170 - creamy coloured gum. MNH - Mint Never Hinged. MLH/MM (etc) - a mix of MLH and MM with the majority being MLH. MLH - Mint Light Hinged - lightly hinged no hinge remainders. GAMBIA MNH 1938 KGVI SG150-161 COMPLETE. CONDITION AS SCAN. Major Faults such as Pinholes, Major Creases, Thins and Tears that are not noticable from the scan are always Declared. A very fine used SG14B 3d Bright Ultramarine, with fine colour and a crisp red CDS. Andrews Type 8c. made with love by. 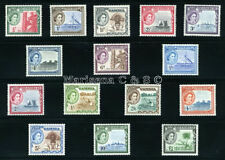 Gambia 1938 KGVI set complete superb MNH. SG 150-161. Sc 132-143. Gambia 1938 KGVI set complete superb mint never hinged. Gibbons # 150-161. Scott # 132-143. GAMBIA(QE-II1971 Mi#276-291 Tropical Birds ) MNH SuperB Cat.Val. Gambia KGVI 1938 complete set mint o.g. 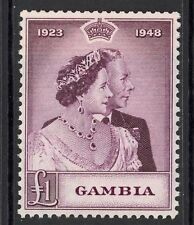 Gambia 1953 QEII set complete superb MNH. SG 171-185. Sc 153-167. Gambia 1953 QEII set complete superb mint never hinged. Gibbons # 171-185. Scott # 153-167. 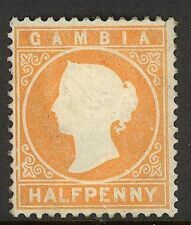 GAMBIA SG37/44 1898 DEFINITIVE SET. Gambia Scott 132-143, mint hinged. Fresh, popular set. See scans. As shown; as is. B & D Stamp Corp.
1922-29 KGV Elephants set 4d to 5/- wmk mult crown. VF fresh MLH. SG 118-21 cat £120. (4). 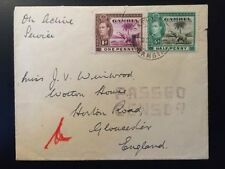 First Day Cover d/d 12th May 1937 postmarked G.P.O. Montserrat Carrying full set of 3 stamps. 1d, 1 1/2d and 2 1/2d on fine registered cover with illustration Addressed to Southampton and showing on reverse access to UK through Plymouth. 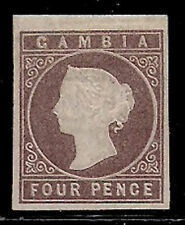 Gambia 1938 KGVI 1½d brown-lake & bright carmine MLH. SG 152. Gambia 1938 KGVI 1½d brown-lake & bright carmine mint lightly hinged. Gibbons # 152. 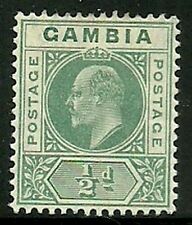 Gambia 1922 SG 122-42 MM cat. GAMBIA 2003 SG4854a/MS62 60th Anniversary of WWII 2nd issue - 2 sheetlets 2 mini-sheets - unmounted mint. Catalogue £56.